Interesting and profitable, Area 21 is a video slot game from Cryptologic's excellent portfolio of close to three hundred online game offerings. 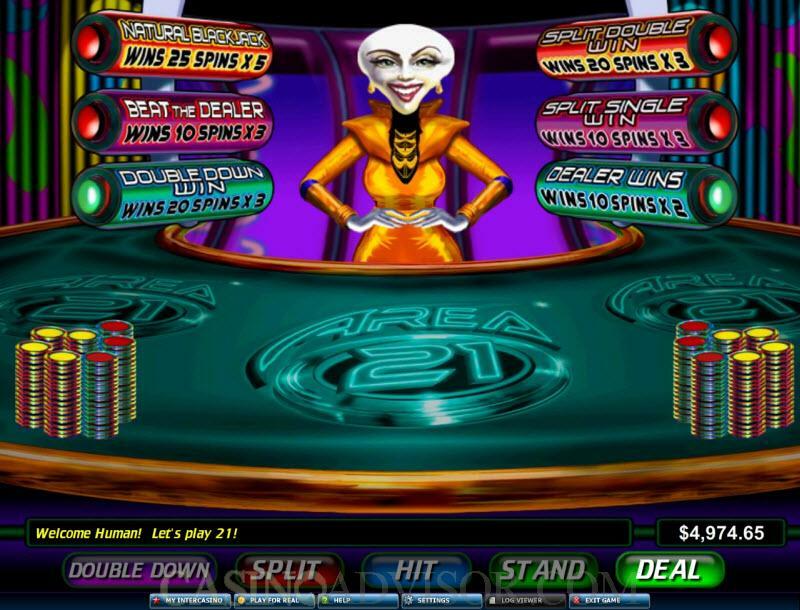 Area 21 has five reels and twenty five pay lines, centered on a theme that is a combination of aliens, and a blackjack ambience. The minimum wager in the Area 21 slot game is $0.01, while the maximum bet is $20. You can bet up to twenty five coins in this game. The graphics are brilliant in this game, powered by state of the art Cryptologic software. Bright, cheerful and colorful, they add a new dimension to playing slots. There are many reasons why Area 21 is set to become an extremely popular game with online slots gamers. The game is appealing to players because of the attractive bonuses, the excellent game experience, and the top notch software provided by Cryptologic. The combined aliens and blackjack theme of Area 21 makes an interesting mix. This is brought out particularly well in the bonus feature game, where you have to play blackjack against an alien dealer. In the bonus round, it is possible to earn up to twenty five complimentary spins whose rewards come with a multiplier of five times. In addition, there is a three times multiplier on some of the combinations that earn you free spins, so you can fill your pockets here on a good day. The scatter symbol in Area 21 is the Area 21 logo, a very profitable symbol when it appears on your game screen. Getting five scatter symbols on the reels will earn you up to fifty times your wager. A minimum of three scatter symbols is required to activate the free spins bonus, and when you do, you have to play alien blackjack. The dealer and you both get two cards each. It is then your call - you have various options such as hitting, standing or splitting a double down, and you have to pick one of these. As in regular blackjack, the objective of this bonus game is to add cards whose sum is less than 21. Coin sizes in the Area 21 slot machine game range between $0.1 and $20, so this game suits high rollers as well as low stakes players. Up to twenty five pay lines can be activated in Area 21 slots. The auto play function makes game play a breeze when you have other things to attend to. 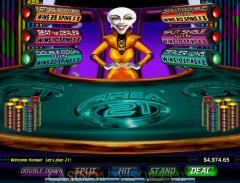 Try your hand at Area 21 - you can play this fascinating video slots game at casinos including Inter Casino and VIP casino, unless you are a resident of the United States of America. Interested in reading more detailed information about Area 21? If so Click Here for more details.